For this challenge I experimented with a number of design ideas, and after one ‘false start’ this is the second one that I tried. As usual, once I started work on the design, the piece took on a life of its own and developed as I worked. 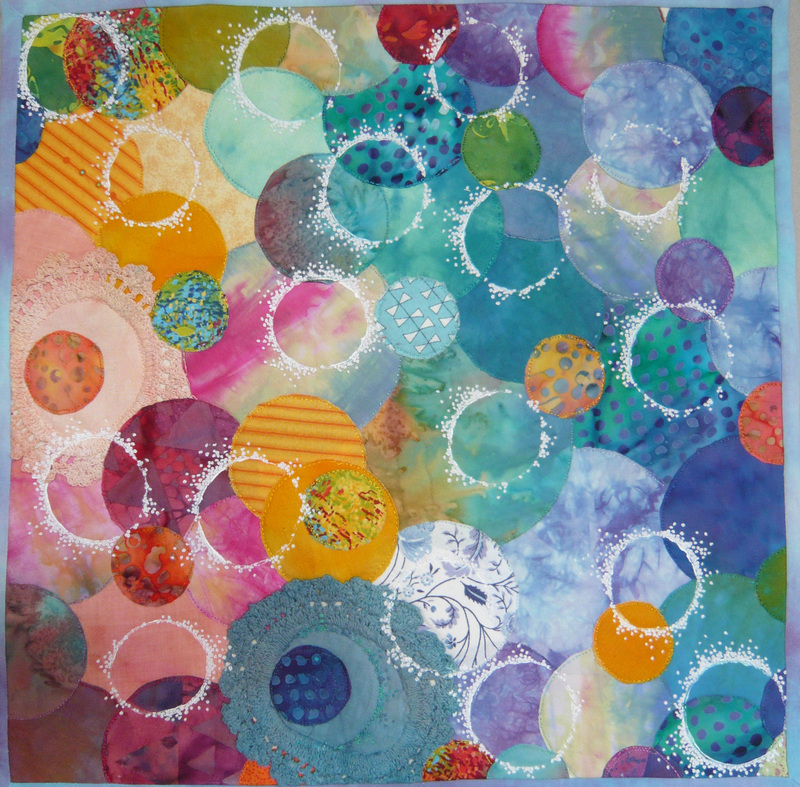 My original idea was to have circles of a number of colours and sizes and to build these up in layers. I mixed both commercial and hand dyed fabrics, and three different size circles. I had thought at first that I would use shades of blue and green only, but as I rifled through my stash, other colours shouted at me, and added a liveliness to the piece that I liked. After laying all my circles down, I machine quilted around their edges. I wanted to add a further layer to these, and stamped white circles with acrylic paint using the end of a cardboard tube (you can guess where that came from!). These give a line of variable thickness, and I added hand-stitching that followed the line of the acrylic. I used French knots, which to me are a circular type of stitch, and I made the these more densely packed in areas where the acrylic line was thickest. I spread the stitches out from the stamped lines, leaving the centre of the circles clear, and making the stitches less dense as they moved out from the circle. This gave a sort of ‘splash’ effect, like the drips which appear when something is dropped into liquid. I used a single colour for this hand stitch to bring the design together and to give it some continuity. Looking at the finished piece the title became obvious to me – a splash of colour! Joan it really is a beautiful splash of colour, The white overprint is very effective and I love your hand embroidery. What an effective approach to accenting those white circles. They have the appearance of bubbles, which is in keeping with the whimsical colours of the piece. Great fun! 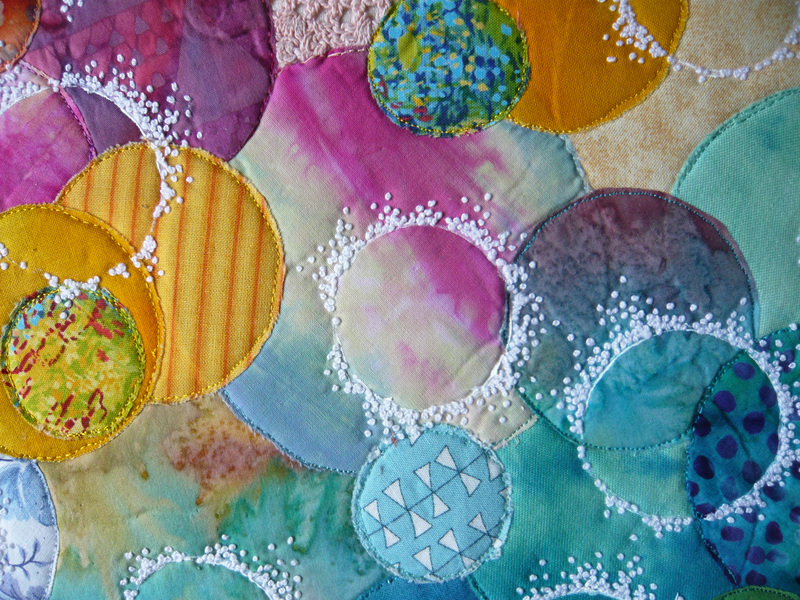 Love your colours, the idea of the white circles and the white embroidery, which is very effective, connecting the circles to each other and making it a very interesting piece to look at, well done! Joan, I just love this piece – the colours convey joy. The number of French knots are amazing and the white paint from the cardboard tube adds another dimension, as does the lace edged doiley. The use of the cardboard tube made me grin – recycling? I love it ! it is really a splash of colours. But the best is the conbination of the white prints and french knots : great idea and so effective ! This lovely quilt makes me think of bubbles blowing in the sunshine and reminds me of when Fox used to go chasing around the garden to burst them. No doubt about it the white french knots completes the quilt. Colourful and yet extremely peaceful. I love the mix of fabrics and the addition of both the textured pieces and the french knots. Great idea with the tube! Thank you for the explanation of how you created this colourful vision of circles. The detailed photo really shows how much effort you went to with the hand stitching and layering. This “splash of color” piece is wonderful and up close with your details even more so. i am currently going through a “circle cycle”… and enjoyed veiwing your work. now to view the rest of the 15 circles . thank you all who made this challenge and my day,today! The idea of the white circles enhanced with the french knots is just fantastic and draws you in to the piece. This really is a splash of color! And all those French knots! It must have taken hours to make them, but they give your quilt a great touch.